POINT LOOKOUT, MO. 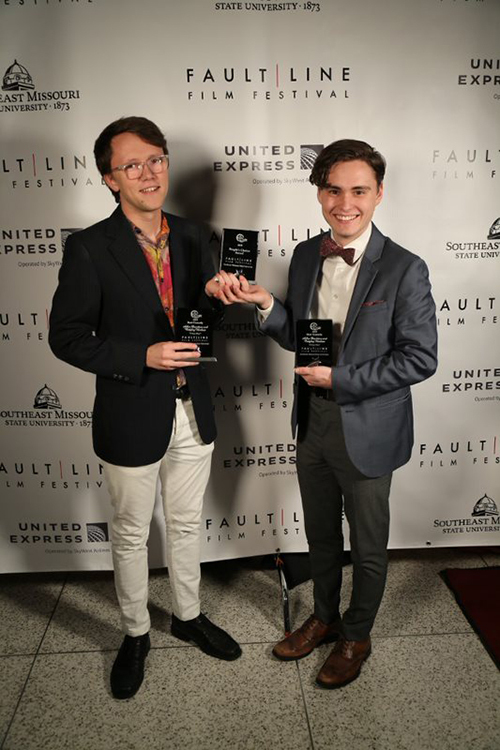 — The film, “5 Year Plan,” produced by College of the Ozarks students Adler Davidson, senior video production major from St. James, Missouri, and Ridgley Harless, junior video production major from Walnut Grove, Missouri, received awards for “Best Comedy” and “People’s Choice” at the Fault Line Film Festival. Davidson and Harless entered the film, a comedic retelling of Davidson’s attempts at figuring out his career, into the Fault Line Film Festival in Cape Girardeau, Missouri, on Nov. 9, 2018. “5 Year Plan” was submitted online and reviewed by judges before being selected for the public viewing. The festival, which is hosted at Southeast Missouri State University, is an annual narrative short film competition for university and high school students throughout the Midwest. Davidson and Harless produced the film as a semester long project for a Special Problems of Comedic Writing course with Dr. Curt Wilkinson, associate professor of communication arts. Students were invited to see the local debut of “5 Year Plan” on Dec. 10, 2018, at the College of the Ozarks Jones Auditorium. It was featured as part of a one-hour comedy special by Davidson.